Wining, dining, and gift giving is more than just a perk of holding corporate office. These rituals are a time-honored and time-tested way of conducting business, and can be crucial to maintaining good firm-client relations. But there are potential pitfalls. If not properly managed, all that well-intentioned back and forth can result in conflicts of interests at both firm and regulatory levels. An enterprise financial firm's compliance team is responsible for making sure these conflicts of interest don't arise, or are caught as early as possible. As with so many aspects of modern business life, software is the key to successfully managing the inflow, outflow, and analysis of a firm's gifts-and-entertainment data. With that in mind, here are the relevant compliance platform features you should be looking for. A compliance platform in this day and age isn't doing its job if it's not relieving compliance officers from the kind of time-consuming decisions that can absorb excess amounts of their day-to-day mental energy. This means a system that offers the capability for automated permissions and denials, or pre-clearances. In this case, for gifts and entertainment. When designing and building a compliance platform for your enterprise financial firm, a good vendor takes into account your firm's own code of conduct: essentially programming it into the application your employees will use on a daily basis. Employees log in to the application and query the system to determine whether or not what they want to do conforms to the firm code of conduct. If it does conform, the application automatically generates a permission. If it doesn't, the application automatically generates a denial. If something is requested that's beyond the limits of the programming, or something is requested that sets off a pre-programmed alarm bell, that will be communicated to the compliance team's designated higher-up. In any of the above situations, an algorithm does all the hard work—the sifting and sorting and decision making—that only a flesh and blood compliance officer was previously able to do. But perhaps most importantly, in the right system each request will be assessed individually, taking into account the role of the employee in the company, their individual gifting allowance, the nature of the gift, and the relationship of the giver or receiver to the firm. A well-designed, well-built compliance platform doesn't do its job all alone. A good platform collects and integrates data from systems across your business, which are cross-referenced when any request relating to gifts and entertainment is made. A human resources system is a natural to integrate with, as are any historical gifts-and-entertainment records. Integration with other firm systems, like HR systems, is key not only to the automated decision making process but also to identifying the firm's highest risk actions and individuals. It gives your compliance team the best shot at picking up on anomalies or other unusual patterns of behavior that may raise a compliance officer's eyebrows, and therefore warrant further investigation. On a less suspicious but no less important note to the potential well being of your enterprise financial firm, a well-integrated system can also aggregate gift-and-entertainment requests relating to specific individuals or companies, to ensure that gifting limits for each client, supplier, or employee are not exceeded. Again, in the right system, every request will be be assessed individually. Once your integrated compliance platform vigilantly puts you on the trail of an individual or group of individuals whose activities require a closer look, it should then continue to be by your side as you manage the case all the way through from detection to resolution. The right system will enable you and your team to collate data and evidence, add annotations, and assign the case to relevant team members for immediate resolution or further investigation. The entire case cycle should automatically be recorded on the compliance platform for audit purposes, with management reports available to help identify trends and support continuous improvement. This brings up reporting and management capabilities in general. A good platform gives teams a 360-degree view of all employee behavior and activity, enabling comprehensive, meaningful, and customized reports to be generated. The ability to produce graphs and charts—to make information clear and easy to interpret—should be a given these days. If you're going to go for broke, and really try and max out the capabilities of your automated compliance platform, look for a vendor that offers company and contact management. 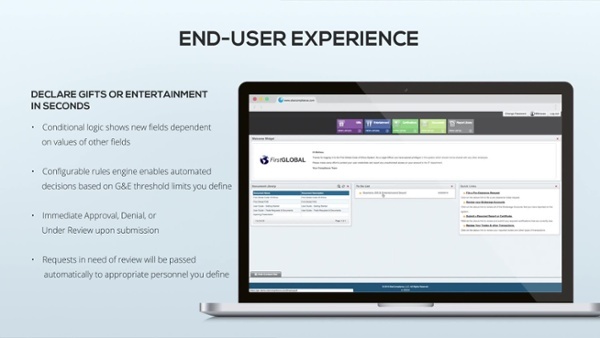 This will allow you to manage client company details entered by your compliance team or taken from any other data feed, so employees can choose from a pre-approved list when making requests for gifts or entertainment. Also consider integrating your compliance platform with your CRM system, which will eliminate the need for double data entry, as well as with your expense system, which will capture gifts and entertainment outlays made on company credit cards. If the devil really is in the details, it's best not miss a single one. Gifts-and-entertainment monitoring has become especially important in light of the Foreign Corrupt Practices Act and the UK Bribery Act. StarCompliance has been designing and building automated compliance software for nearly 20 years. We've optimized countless compliance programs for our clients, and understand how important employee monitoring is to the safe and continued successful operation of your enterprise financial firm. 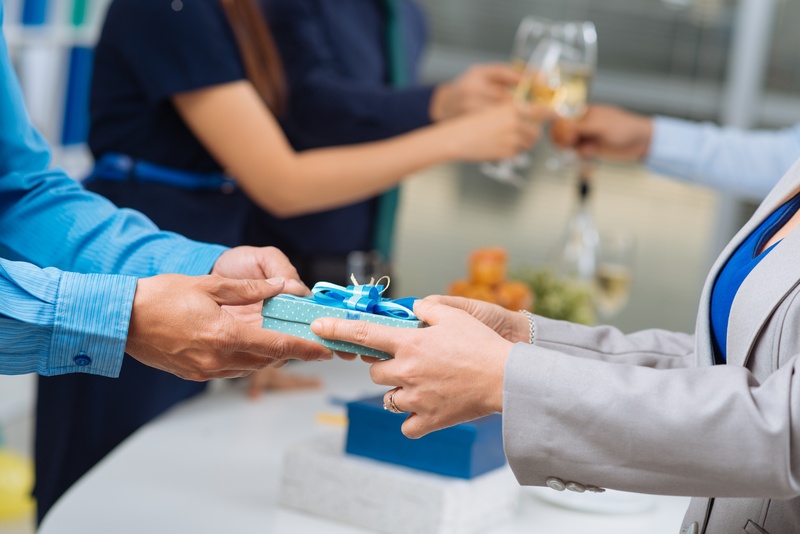 Our Gifts And Entertainment Product will allow your employees to pre-clear and report planned gifts and entertainment, ensuring that internal and external conflicts of interest are avoided. Find out if Star has a solution waiting for you. Chances are, we do. Book a FREE demo now.